The presumption of innocence is not only a long-standing principle that has withstood a thousand years of history and politics; it is also a fundamental right enshrined in the Charter of Rights. It doesn’t matter how serious the crime is or how strong the evidence looks: every person charged with a criminal offence is innocent, unless and until the state proves him guilty. So why is the presumption of innocence under attack? Why is the federal government (which is responsible for the criminal law) undermining centuries-old laws designed protect the innocent while a court seeks to decide the question of guilt and innocence? The federal government, which promised a thorough review of the criminal laws in this country, is instead rushing through changes that limit a defendant’s ability to examine evidence in serious cases at a preliminary inquiry; and abolish a defendant’s ability to meaningfully participate in jury selection; and maintain mandatory minimum sentences that all courts in this country have repeatedly found to be a violation of fundamental rights. Why? Politics. It is easy, in an era of highly publicized gun crimes and court delays and the #MeToo to score cheap political points by demonizing “criminals” and promising to convict more of them more quickly. When the government gets bad publicity because of court delays, they look for a quick and cheap fix. Court delays are a good example. For years, criminal cases have taken longer to complete. There are many reasons for this. The law has gotten more complex. For example, in sexual assault cases, the government has imposed limits on what evidence can be introduced at trial, and what questions can be asked of witnesses. Litigation over essential Charter rights adds to the length of a trial. Also, there are more criminal cases. As the population grows, especially in large urban centres like the GTA,more people means more criminal cases. When municipalities put more police officers on the streets, it means more people get charged and more criminal cases in court. But the same governments that win political “law-and-order” points by hiring more police and passing laws that make it more complicated to defend the innocent, fail to spend the money necessary to keep up with the growing number of cases in court. And when the results of years of under-investment create a crisis, and cases are being thrown out of court, the government, instead of trying to really understand and address the problem, looks for a quick fix and blames everyone else. Good justice- fair and efficient justice- is expensive. 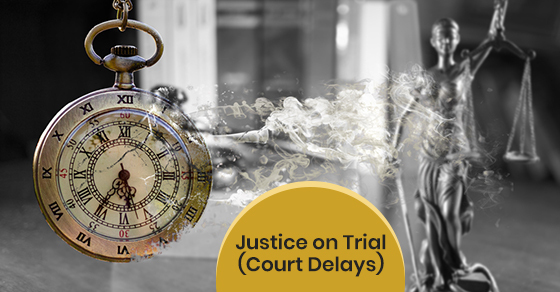 If there was a quick and easy fix to court delays, governments would have fixed them years ago. There are many highly publicized issues that have generated controversy about the criminal justice system in Canada in recent years: from early parole to the Gian Ghomeshi case; from the #MeToo movement to court delays. The Trudeau government declared when it was elected four years ago, that as part of its “sunny ways”, it would review and reform the criminal law to make it work better for all Canadians. Unfortunately, the government has shown that it will not match its words with its deeds, especially when those promises are expensive. And so the delays in court drag on- and the politically expedient, cheap band-aid solutions they have come up with will cover up the problem just long enough to be passed on to another government. The politicians win, the Canadian public loses. Again.